In the Orthodox Church calendar there are certain days that commemorated the dead. These dates are referred to as Ecumenical parental Saturday. One of the most revered Saturday is the memory of Saint Nicholas, which in 2015 falls on the 30th of may, new style. Approval of the Orthodox Church, the tradition of commemoration of the dead has a beneficial effect on those who are commemorated, and the surviving humans, after all, for the last remembrance of the dead is a testimony of love for the deceased relatives. This is why the Church has established certain days in which people should be especially prayer to commemorate the deceased loved ones. In all Orthodox churches, the cycle of daily worship begins with the evening, so the funeral panalee worship services at Trinity parent Sabbath begins on Friday night (in 2015 - 29th may). Friday night is made special funeral Liturgy Vespers and Matins first hour, during which are read the 17th kathisma, Requiem Kanon, as well as sound and other funereal lament of the common following the service. On Friday evening, the priest repeatedly reads the note with the names of deceased Orthodox Christians. Trinity parent on the Saturday morning (in 2015 - may 30), the churches committed funeral Liturgy with prayers for the dead, after which the funeral service. 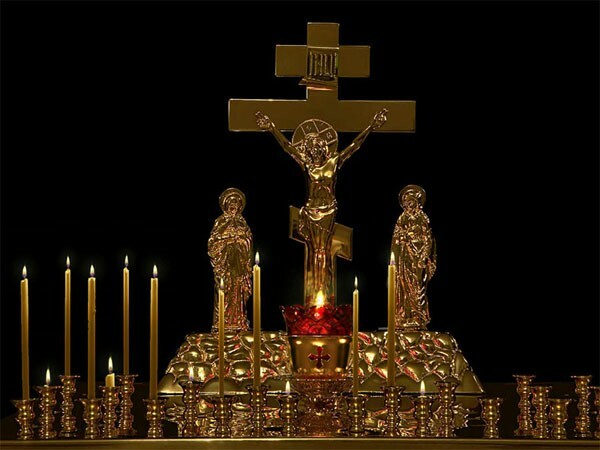 For the Orthodox person it is very important to be in those services, because the gland in the commemoration of the dead is a prayer for the memory of them. Notes with names of deceased loved ones served on the Liturgy (and the Liturgy of preparation - in some churches these notes are taken separately) and at the memorial service. Also in the temple Friday night and Saturday morning you can put candles in memory of deceased relatives. Memorial candles are put on the eve - a special candle holder, which is a cross with the crucified Savior and the coming of Christ by the virgin Mary and the apostles. In addition to the prayer for remembrance of the dead in the temple, believers in the Trinity of parent Saturday trying to do more acts of charity in memory of deceased relatives. In particular, can be distributed alms to the needy or may be any other useful help. Must be said about home practice, a prayer of remembrance. In addition to attending prayer services, some Orthodox Christians still remember (pray) for the dead and home, reading, for example, the akathist for adenomera or canons. In the tradition of commemoration at the Trinity parent Saturday, a special place is visiting the graves of deceased loved ones. This practice takes place even among those people who do not consider themselves in the full sense of the faithful not adhere to another religion. It should be noted that the contents of the graves of the dead clean is a moral duty and responsibility of each person. In this sense, the Orthodox are no exception. Therefore, there is a practice after the morning service in the temple to go to the cemetery with the aim of cleaning the place of burial. An Orthodox person must remember that the place of burial of the dead is sacred, so one should try to behave in a cemetery as appropriate. In particular, the Orthodox people came to the cemetery, and there needs to pray to God for the repose of the soul of the deceased. You can then start to do the cleaning. It is worth remembering that for an Orthodox person is not acceptable to the tradition of drinking alcohol on graves or the watering of graves vodka - this is not the Christian traditions of all souls. It is impossible to leave on the graves of cigarettes or container of alcohol, because it is alien to the Christian consciousness.